What is modern farmhouse style? Good question. This aesthetic takes cues from country cottages. It's rich in character and homespun comfort with rustic elements such as wood, burlap, and stone. The result is warm and cozy. But it's better to show than tell. 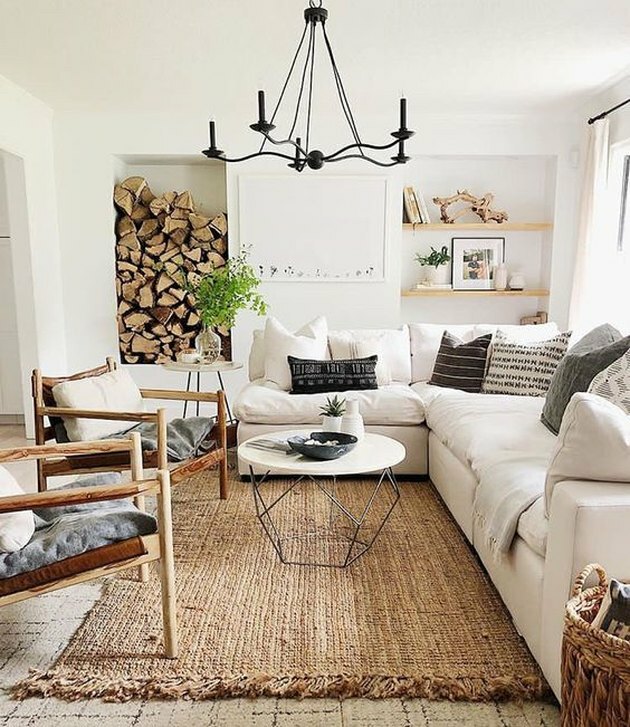 So with that in mind, here are 14 living room ideas that perfectly capture the modern farmhouse look. 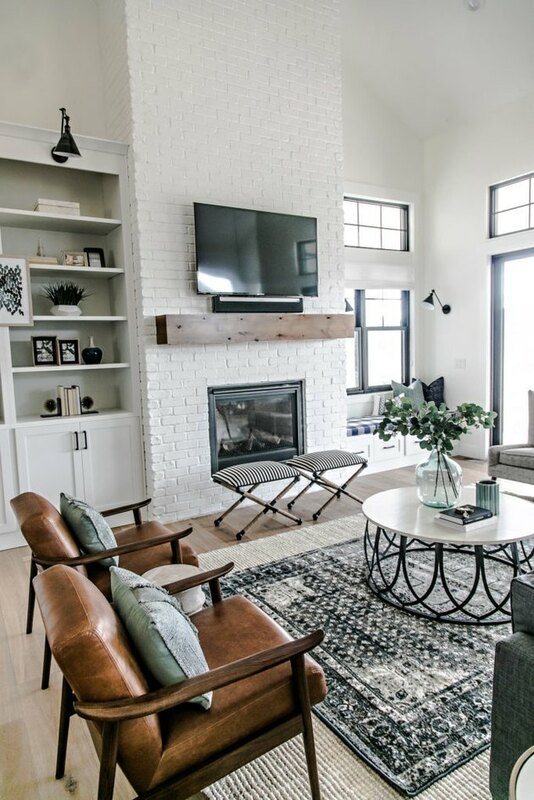 We're big fans of focal points, like this stunning floor-to-ceiling brick fireplace surround designed by Shelby of Farmhouse Living for her mom's home. It's the perfect spot for loved ones to cozy up all year long. 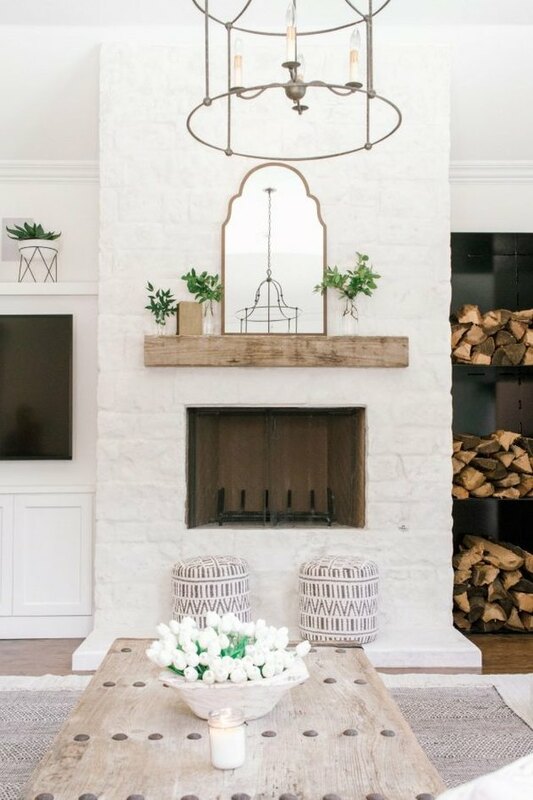 And open shelving filled with stacked logs, paired with a rustic wood mantel up the pastoral appeal. 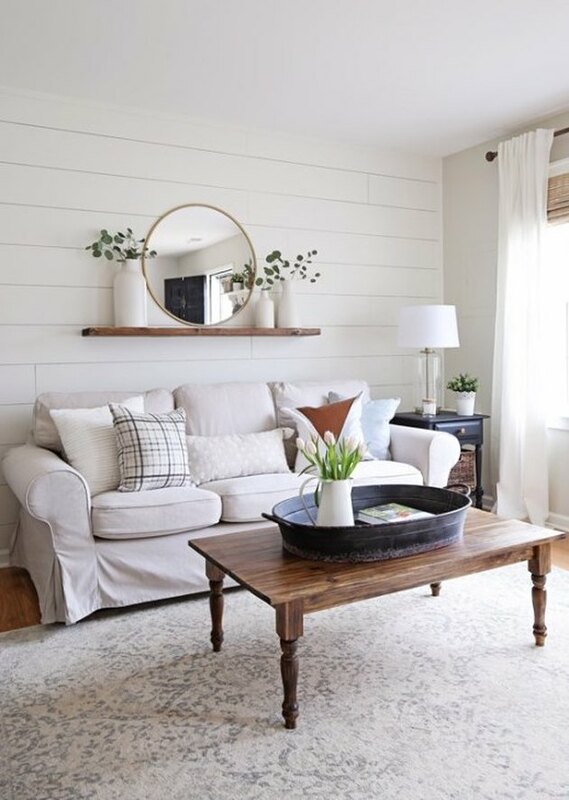 Shiplap walls are the perfect backdrop for your modern farmhouse. You can even do the work yourself, like Angela over at Angela Marie Made did. She DIYed two wood panel accent walls in her farmhouse style living room. And bonus: She didn't even have to break the bank. The overall project cost her about $75! 3. Invest in standout accent chairs. Seating is key to pulling together a space where everyone wants to gather. Of course, a sofa is essential. But so are . We love their timeless carved wood detail. A sophisticated spin on the modern farmhouse aesthetic. 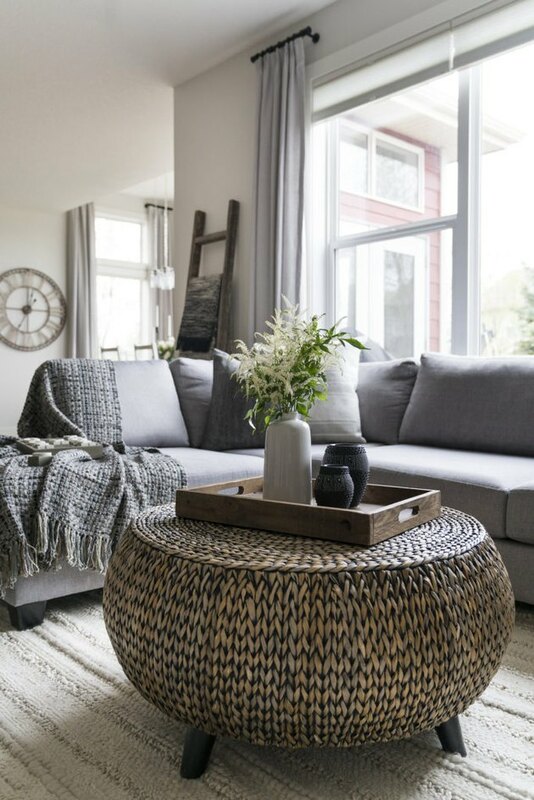 Interior stylist Neelam from Patterns and Prosecco pairs gray hues with homey accents and luxurious textures like this coffee table ( $367.99 ) to create a space that's elevated yet family friendly. 5. Opt for muted neutrals. 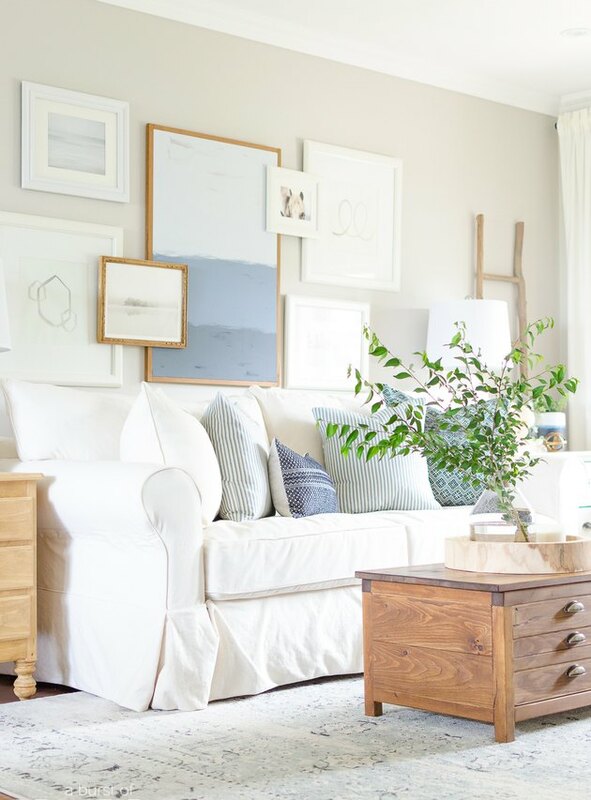 An all-white palette has many benefits, but feeling ultra-inviting isn't always one of them. Instead, opt for muted neutrals. 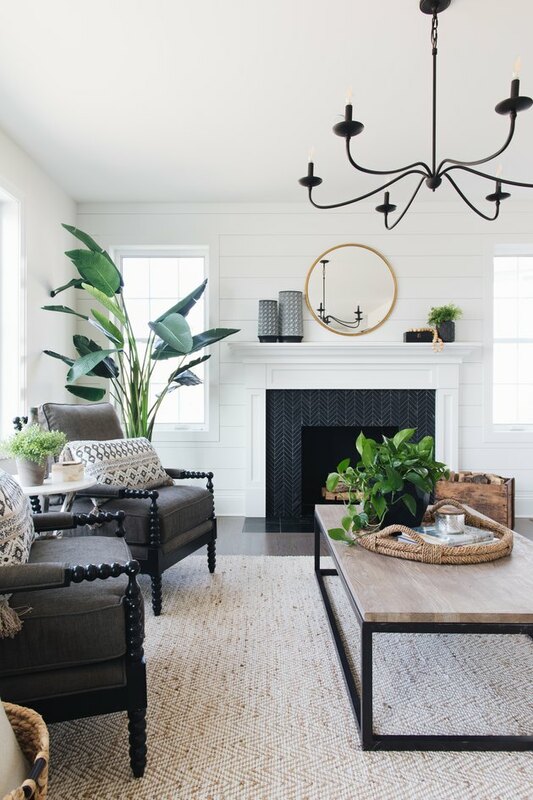 Take a cue from this quaint living room which belongs to Alicia from A Burst of Beautiful: Leafy foliage, light wood, and an artistic gallery wall inject a major dose of warmth. 6. Or, add a pop of color. 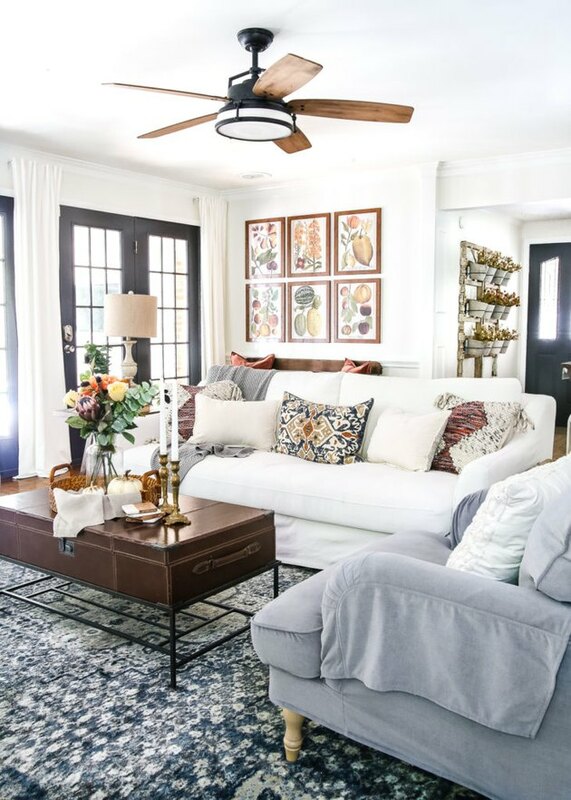 Farmhouse meets modern style in this lakeside residence designed by Jean Stoffer. 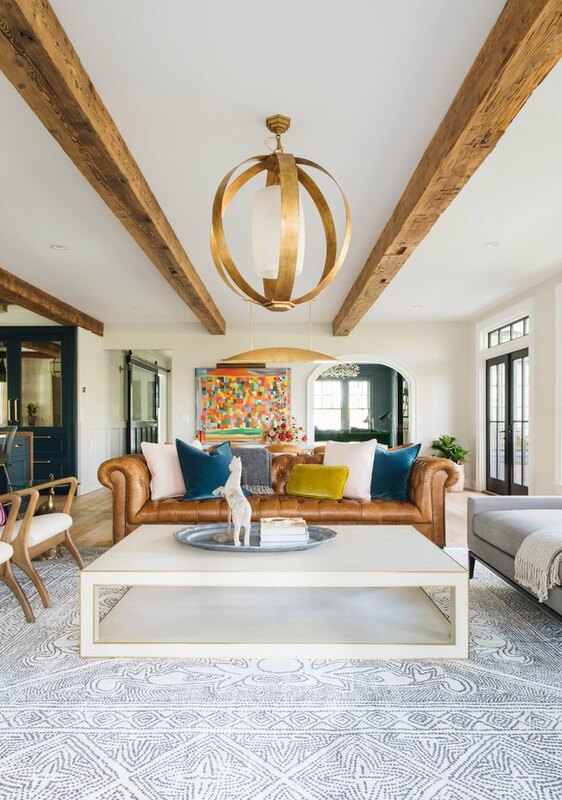 The ceiling beams are perfectly bucolic, yet the Chesterfield leather sofa and the bright colors (which show up in the pillows and artwork) feel completely contemporary. 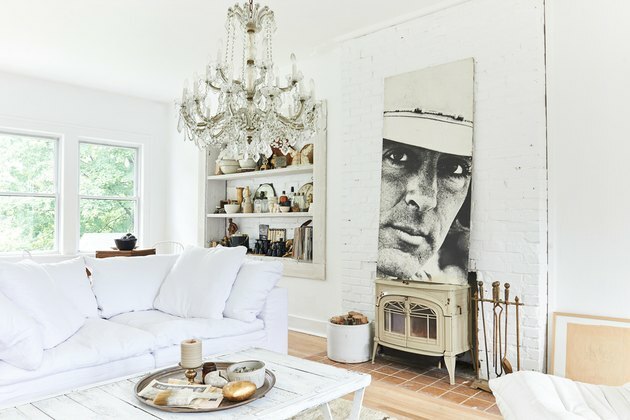 Interior designer Leanne Ford's sun-drenched living room beautifully balances a crisp white palette and statement furnishings (such as a striking crystal chandelier and a large canvas print of a cowboy) plus a wood burning stove for extra warmth. The result is modern farmhouse to a tee. 8. Repurpose items around the house. You know what they say: All things old are new again. Take inventory of the furniture and decor you already have and repurpose it in a new way. Interior designer Katie Hackworth did just that in this modern Medina, Washington farmhouse. The reclaimed beauty of this chest is a stylish storage solution that doubles as a coffee table. 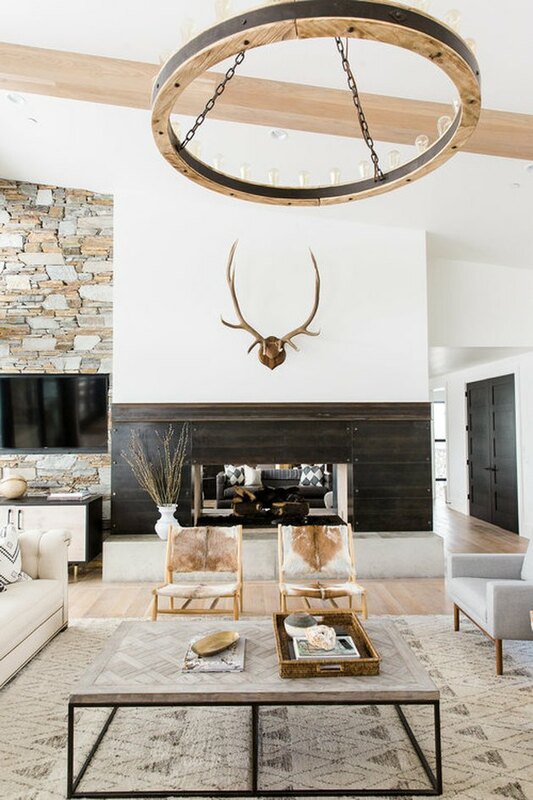 This Park City, Utah home has great bones. (Ahem, wood-beamed ceilings.) 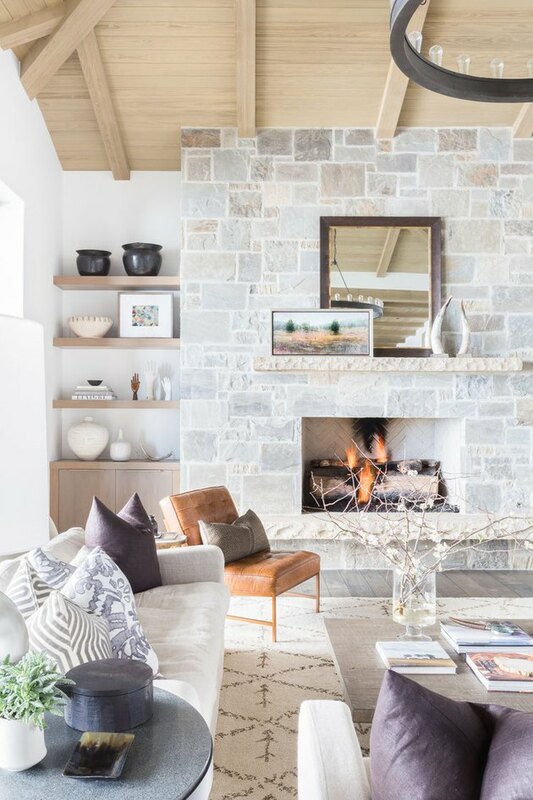 So it wasn't hard for interior designer Nicole Davis to create a stunning yet cozy rustic living room. But in order to give the space character and personality, she used built-in open shelving to display sentimental tchotchkes and mementos. 10. Be selective with decorations. Classic furnishings and neutral tones are a comfy foundation for infusing country charm through accents. With them, decor can be switched out season to season. Blogger Lauren from the Bless'er House gave her living room a fall makeover with harvest art, seasonal blooms, and embroidered pillows. Area rugs instantly add warmth to any room. Interior designer Sita Montgomery demonstrates the power of floor coverings by layering two different designs. This trick really grounds the space, while enhancing the already inviting quality. 12. Let there be light. Ceiling lighting is super important, both in terms of style and function. This wrought iron candelabra chandelier ( $278 ) is an enchanting addition to Anissa from House Seven Design's living room. It's rustic, earthy, and imbues a distinct sense of place. 13. Invest in a comfy sofa. The sofa is the heart of the living room. You want something comfy and snuggly that's still attractive. 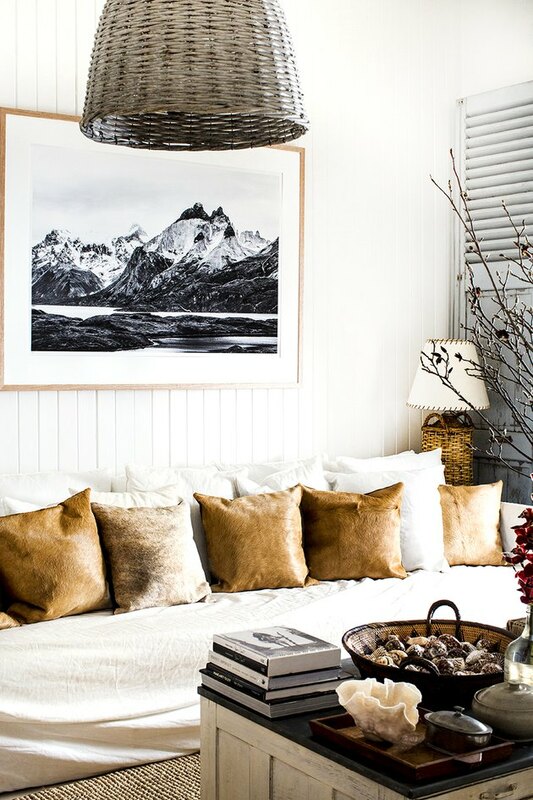 And photographer Kara Rosenlund's sofa, filled with an assortment of rustic throw pillows, definitely hits the mark. It doesn't hurt that while lying there you can stare at her beautiful photographic print of the mountains in Patagonia ( $290 ). 14. Expose those ceiling beams. 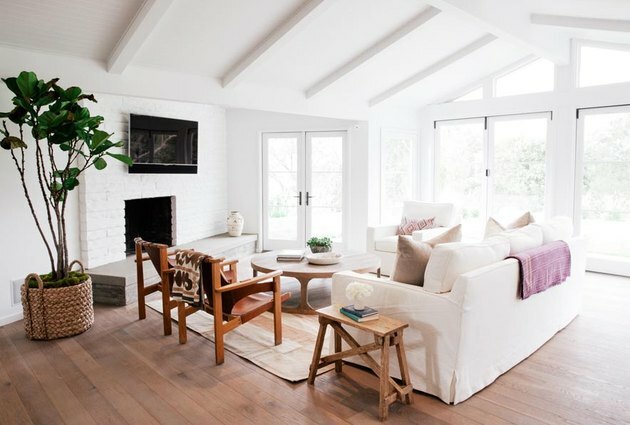 This bright, white Montecito, California home designed by architect Michael Eserts is a relaxing oasis. The wall of floor-to-ceiling windows really bring the outside in, but perhaps more importantly, they draw your eyes up so you can appreciate the home's architectural beauty.